This is just one of the examples how CD, among other goals, aims towards environmental protection through pointing out the significant importance of the hardworking and diligent insects. Beekeeping in Slovenia is a signal of concern for the environment and nature preservation, and CD, the biggest Slovenian congress centre, recongized this some time ago. As a contribution to increasing Ljubljana’s biodiversity, beehives have been installed on the building’s rooftop. Approx. 150,000 buzzing Carniola bees are now pollinating city plants and providing honey as a unique CD product. With urban beekeping on their terrace they are extremely proud on being the pioneer of this kind of Slovenian initiative. Another interesting fact that shows how CD’s essence is intertwined in one way or another with bees, is the fact that among CD’s employees there is also a Honey Queen. Namely, Mateja Šoštarič, wearing the flattering title from 2016 until the end of 2018, is the ambassador of Slovenian beekeeping, Slovenian honey and bee products. In the meantime, she does her student internship at CD. Among obligations connected to the CD’s meetings industry, Ms.Šoštaršič these days accepts visitors and answers to their questions, gives them information and directs them around in a special pavilion where visitors can use VR glasses and follow a bee’s fly through Savinjska Valley. On Sunday, 20 May 2018, visitors to CD will be able to actually see the CD’s beehives and even taste the CD’s own Honey. There are two visits scheduled: one at 1pm, and the other at 5pm. At 7pm film and post-screening talk, titled More than Honey, by Markus Imhoof in Kosovel Hall is scheduled. More than Honey aims to allow the spectator to understand the drama at play and highlight the pressures of the global economy on the small insects. 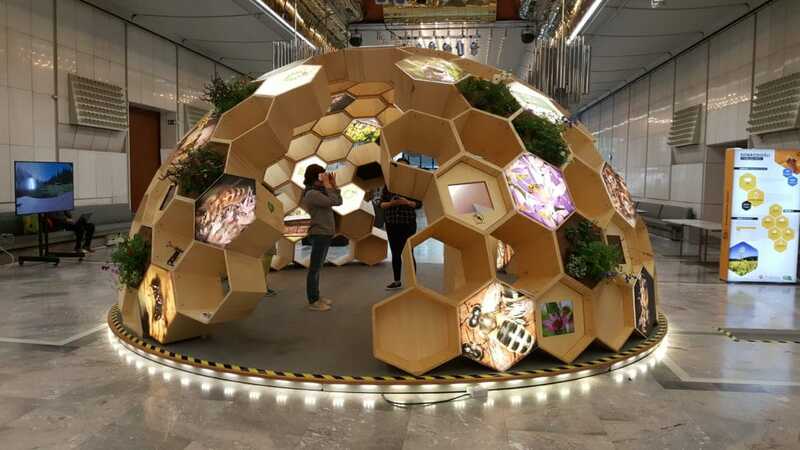 All day long, between 10 am and 7pm, it will be possible to get into the Interactive Pavilion, talk to the Honey Queen, and use VR glasses for a mindblowing experience of a bee flight.